I've had this pillow for a few years and it has held up wonderfully well. Color is bright and fabric is soft. I haven't needed to wash it yet since it is decorative. Add a dash of fun color to any room with the Entwistle 18-inch Decorative Throw Pillow. With its velvety texture and pom-pommed corners, this pillow is a must-have for your home. The down throw pillow is wonderful! Love the color, the comfort and the vibrant image that it has in my room! These pillows have little tassles that hang off all four corners and the tassles ARE NOT the same color as the pillow. This accent is not very visible in the picture. Also, was not impressed with the quality of the fabric, which has a slight sheen to it. These pillows are just okay. We order a lot of pillows for our model homes and Staging jobs on this site. Believe me when I say most are REALLY nice. But, these are thin and not as nice as other options. Beautiful pillow, full and fluffy. The tassels on the corners add that little flair needed. Used these to brighten up a grey/white bedroom. 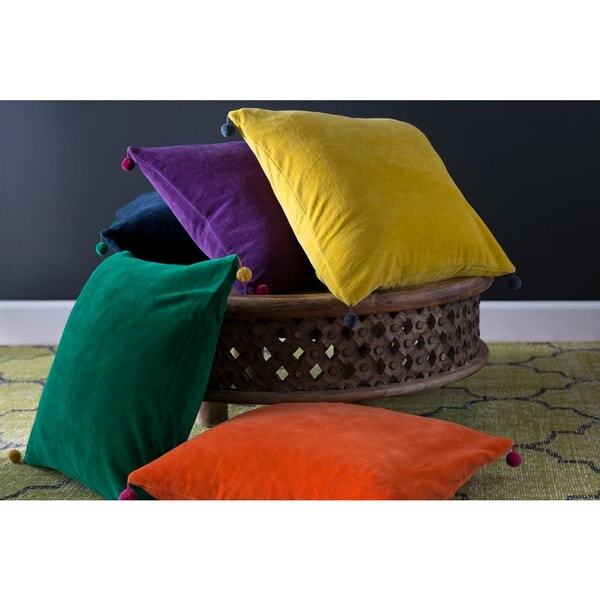 These are wonderful, but expensive (in my opinion) throw pillows true to color. Navy is navy, emerald green is really emerald green. My pillows were purchased March 2018 and I couldn't be more pleased. I snipped off the horrible ball tassels (what were they thinking? ), of course, but otherwise, these pillows are marvelous. I bought two of these thinking they would be in the primary colors shown in the photo. But they are an ugly pale green, very cheap looking and nothing like the photo. After some resistance about "exact color not being guaranteed" Overstock agreed to pay for shipping them back for a refund. Huge disappointment. Feel the product was misrepresented in the photo. Love the lilac color just what I needed for bedroom. "Is the violet color as shown in the picture?" We try to represent the colors of our products accurately in the images on our site however, due to the difference in monitor colors, some colors may vary slightly from what you see on your screen.